Host a wine and cheese party and savor every word, sip, and bite. Whether you are observing a holiday, honoring a special occasion, or simply celebrating the amazing friendships in your life, parties are a great way to gather people together in a fun and relaxed atmosphere. Fancy balls, extravagant galas, and carefully planned theme nights make wonderful memories, but for many of us, time and cost constraints often relegate such festivities to the once in a blue moon category. Still, elegant evenings and valued relationships needn't be put on the backburner, and whether you are looking for classy or casual, wine and cheese parties provide all the sophistication while requiring very little work. And since all the preparations can be completed ahead of time, they also allow the host to mingle with the guests and participate in the taste testing. While preparations for wine and cheese parties are quite simple and can be planned at the last minute, it is still recommended to choose a date at least two weeks in advance to ensure that all your guests are able to attend. If your gathering is casual, you may wish to simply send an evite or use the phone to personally invite your guests. If you require a more formal approach, design a cheese shaped invitation (or find one online) and print the party particulars on the back. You could even attach the invite to an inexpensive cheese knife or place it inside a plastic wine glass. Decorations for your wine and cheese party should be very simple and understated. Use plain white tablecloths and candlesticks. If you are able to find Old World paintings/prints or vintage bottles, they may be used to add to the atmosphere. Since the wine and cheese will be the focal point, your choice of platters, cheese knives, and stem ware will give your party the desired feel. For a more casual party, choose wooden cutting boards, wicker baskets, plain knives, and simple, or even plastic wine glasses. To create a more elegant or sophisticated aura, use crystal plates, serving platters, and glasses, fancy bowls or painted baskets, and specialty cheese knives and spreaders. To add a fun twist to your wine and cheese party, try having a "blind taste testing". Cover the labels or put the bottles in paper bags. Give your guests a brief description and see how many wines they can correctly identify. The winner could receive a prize of a bottle of wine, a book on wine tasting, or a recipe book. You could also include a wine trivia question at each station, or have trivia question contests throughout the evening, awarding small prizes to the first person to correctly guess each answer. You could choose a particular wine varietal or region and have everyone bring a bottle of wine in keeping with your theme. Each guest could be allowed a few moments to discuss the attributes of their chosen wine, thus making your party not only fun, but also informative. 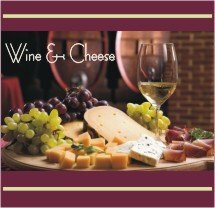 Design a tasting card to give each guest upon arrival at your wine and cheese party. The complexities of these cards will depend upon the formality of your party. For a more formal occasion, include a list of the types of wine, the vineyard of origin, year, and a brief description. This allows the guests to record the particulars of the wine, such as aroma and flavor, as well as their preferences with various cheese pairings. For a more casual party, your guests could use the cards to rate the wines and document those they wish to purchase at a later date. Since cold will mute or dull the flavor of the cheese it is important to serve it at room temperature, so be sure to remove it from the refrigerator at least an hour before the party is scheduled to begin, allowing it sufficient time to mellow. Arrange the cheese and place an appropriate knife on each platter or cutting board. You may prefer to slice the cheese ahead of time; however, to prevent drying, it is recommended that you allow your guests to do it themselves. Remember, do not serve strong and mild cheeses next to each other and keep cheese separate from any other food so it doesn't acquire alternate flavorings. So the flavor of the wine and cheese isn't lost, serve plain breads such as Italian loaf, French baguette,or crackers and have plenty of water available for guests to drink between tastings. If you wish to make your wine and cheese party more of a meal, include dishes of honey, chutneys, mustards, olives, pickled vegetables, various nuts, and dried fruit and serve platters of cured meats such as sausage and ham. Trays of bite size fruit, especially grapes, melons, apples, pears and figs are an optional yet beautiful touch. Give each guest a wine glass or have plastic ones available at each station. If you are serving both white and red wines, or if your guests may not be tasting in a predetermined order, it is wise to have more than one glass available per guest. A general guideline is to pour about 2 ounces of wine per tasting, and the number of tastings should add up to a total of no more than about two glasses per guest. If you have enough glasses, you could pre-pour and have individual tastings available at each station. If guests will be carrying their glasses from table to table, you may wish to assign someone as a "pourer" to prevent running out before all guests have had an opportunity to sample each wine. You may wish to label each wine and type of cheese and include a few notes describing its flavor so guests know what to expect. There are several different options for your wine and cheese party. You could choose to have samplings of the same type of wine from different years or producers, or you could compare wines from different countries. Alternately, you could set up small tables with interesting wine and cheese pairings and allow your guest to sample while socializing. So the full effects of the various vintages are appreciated, it is recommended to order the wines from dry to sweet and from light to full-bodied. Since a sweet wine may dampen the flavoring of a drier wine, setting bottles out in an organized fashion will make it easier for your guests to experience the true essence of each wine. There are a few helpful "rules of thumb" when pairing wines with cheeses, but since much is based on individual preference, there are really no wrong choices. While it is true that you should try to pair based on similar intensities, don't spend too much time stressing about your choices. Unless you are entertaining expert wine connoisseurs, your wine and cheese party provides an opportunity for your guests to learn and experience new and different combinations. If in doubt, fruity wines and sweet wines are the best matches for most cheeses. Aged wines are best with aged cheeses. Young, smooth, creamy cheeses are best served with lighter, acidic wines while older, full-bodied cheeses are best paired with equally full-bodied red wines. Red wines usually accompany harder cheeses, while white wines are paired well with softer cheeses. Often cheeses from certain areas are best served with wines from the same areas (ie. French wine with a French cheese). Cabernet Sauvignon is paired well with harder cheeses such as sharp cheddars, Swiss, or Asiago. Accompany with dried fruit and rye breads. Merlot is best served with cheddars, Monterey Jack, and Gouda. Chardonnay is best paired with mild cheddar and Mozarella. Sauvignon Blanc is nice with blue cheese, goat's milk cheeses, Comte and Gruyere. Accompany with fruit and nuts. Riesling is one of the most popular choices for a wine and cheese party and is very nice paired with softer choices such as Brie, Camembert, and Gruyere. Accompany with fresh, sweet fruit such as strawberries and peaches and serve with light bread or baguettes. Champagne is also paired well with Brie or Fontina. Suggest that your guests eat the cheese slowly, letting it melt in their mouth before taking a sip of wine. This allows them to experience the full affect of the wine on the flavouring of various cheeses. Remember, the above suggestions are simply that…suggestions. Advice on proper combinations varies depending on where you look and who you ask. The more wine and cheese parties you host, the more knowledgeable you will become on matching and pairing, and the more confident you will be in your own choices and suggestions. No matter how you choose to structure your wine and cheese party, it is sure to be a success. Wine and cheese parties are the perfect way to host a classy, sophisticated event while still creating a relaxed and comfortable environment. And, for all you busy people with full schedules, they are a perfect way to experience a lot of fun with very little work.